This morning has been a grey and dreary one here on my part of the Island. And if you're living in the province of BC, then it's also the first day back to school (finally!!). So I thought I would start the week by posting something bright and fun! Enter: my 8th pair of socks for the Socks With Sarah KAL and my 10th pair for the year. I decided to take a break from plain vanilla socks and went with a patterned sock - the Simple Skyp Socks by Adrienne Ku of Mushroom Knits. The yarn, I purchased at this year's Fibrations, is Graffiti by Rain City Knits. I absolutely love this yarn and it always brings a smile to my face every time I get the chance to knit a few stitches with it. I love how pink it is without being overly pink - if that makes any sense. I love the flashes of bright turquoise, deep purple, and the oh so fun neon yellow - which my camera can not do any justice as to how bright and neon-y it really is. The pattern is super simple and feels somewhat like a step above plain vanilla with its easy to memorize stitch pattern. I was hoping to find something that would break up the colours a little and would highlight the colours well. I'm still on the fence as to whether this project is a good match up of yarn and pattern. I like how the yarn is knitting up but I'm not sure if the Skyp pattern is getting lost in all the crazy colours. Yet I love how the stitches are adding great texture to the knit. A part of me thinks I'm just so use to plain vanilla that everything else will just look odd to me. I guess I'll just have to keep knitting in order to find out. I find that it's so much easier for me to rip out my work when it's just a sock, so if I don't like how the sock is knitting up I can always frog and try something else. But I have a feeling that I will most likely keep it as is. It's just a sock, after all. At the time of writing this post I'm currently at the point where I start the heel flap. I was going to do the Fish Lips Kiss heel but decided last minute to stick with the heel flap that's used in the pattern. I have to admit, I love a good heel flap, and with all the self-striping yarns that I have lined up to knit, I don't get the chance to knit heel flaps that often. That, and I'm quite curious as to how this colourway will look in a slipped stitch heel. If I didn't have other deadlines to attend to I reckon that these socks would be finished in a flash. Considering that I've rarely knit on this project, in a 2 week span I've got half a sock done. Not bad, right? They won't be finished by the time the month is over but definitely by the end of October. But who knows, if the weather keeps being all grey and gross I just might be more inclined to knit on these to get me out of the colourless funk that fall can sometimes bring. Any one else knitting on some wildly bright and colourful socks? These past few days I've changed up my sock yarn line up to include nothing but bright, gotta-put-my-shades-on colourways. And yes, I have a sock yarn line up. It's a handful of skeins that I plan on putting on my needles next. There's no particular order, I either just blindly grab whatever or if I'm feeling picky will take whichever one that suits my mood. They all live on the table next to my side of the bed (in a Ziplock bag, of course!) - it's half inspiration to knit, half "they're so pretty I can't bare to keep them buried in the stash". Tell me that I'm not the only one who does this...right? I LOVE that pattern! I should really knit it again sometime! BTW, you need to know that your blog is the best/worst. Best in that I love what you share. Worst in that it ALWAYS, ALWAYS, ALWAYS sends me yarn shopping. You are dangerous, woman! It's definitely a sock pattern that I'm willing to knit again, it's such a nice break from plain vanilla without having to think too much. As weird as it sounds, I'm already thinking of a few colourways and yarns in my stash that I would like to see knit up in this pattern! Haha, I take that as a compliment! ;) I think I like to enable people so that I don't feel too bad about my own shopping habits! You're the only one for who does that... Just kidding! I can't say I do it myself, but it sounds like a good idea. I think I'm going to see if I can score a skein of Graffiti in DK weight at Knit City. I've wanted to use it for awhile but couldn't come up with a good idea, but now I'm thinking, Great Divide shawl. Ooohhh, I've been seeing a lot of really beautiful Great Divide shawls on Instagram lately. Would you pair Graffiti with another colour? What a perfect pattern to really showcase those colours, and it'll be so squishy for fall!! Chantel, you should be able to pre-order if you contact Krista, and then you'll be sure to get what you want at Knit City! I love how bright this yarn is! I just cast-off some hot pink socks (totally out of my usual colour comfort zone) and am now knitting away on deeper purple-y red yarn (plain vanilla socks, but pretty), which feels very fall to me. Next up: blue and white stripes for some man socks! Dang, that is gorgeous! 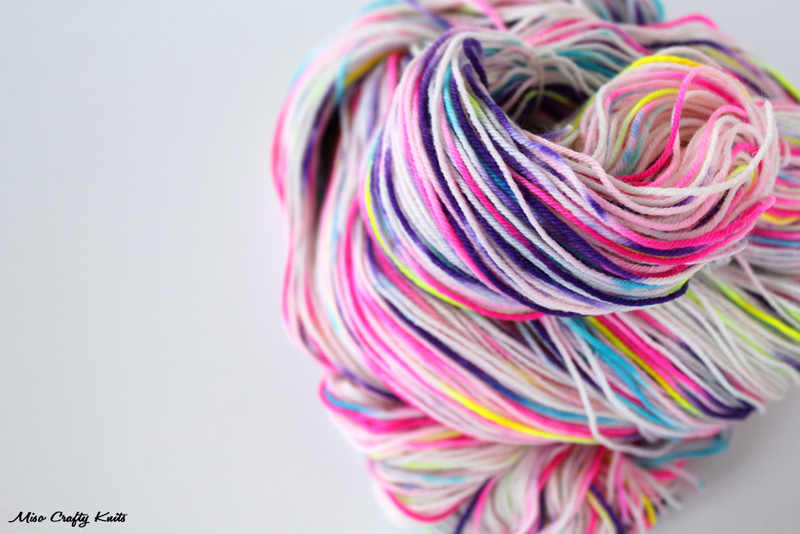 I was resisting the neon yarn craze, but I'm finding myself drooling over yarn the color of highlighters... it's like someone put my childhood sticker book in a blender. So good!